If you love frozen yogurt, you probably know Yogurtland, one of the country’s most popular frozen yogurt chains. 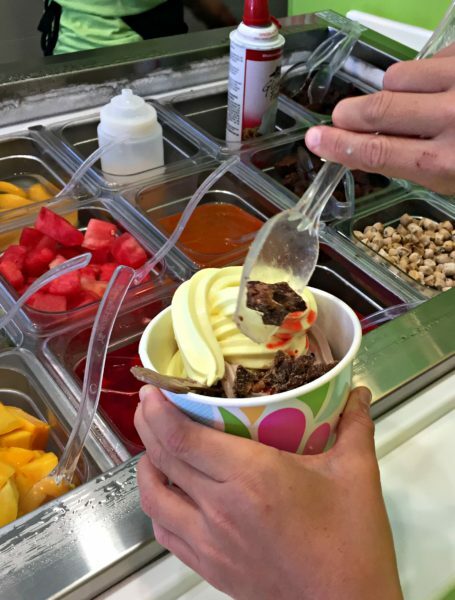 Yogurtland is known for its wide variety of handcrafted flavors and fresh toppings. 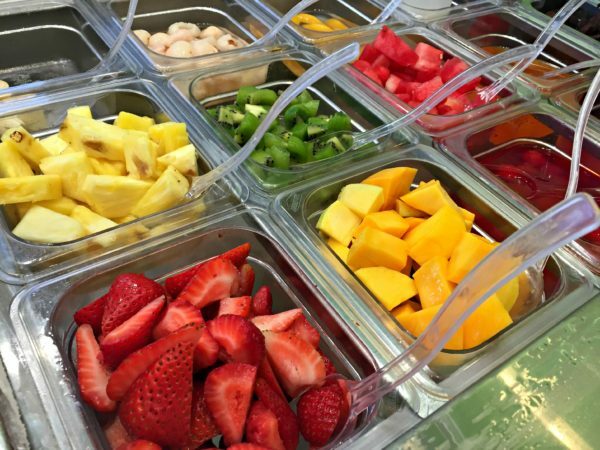 You walk in, choose from up to 16 flavors, and then add your own toppings ranging from fresh strawberries to mochi to Cap’n Crunch. 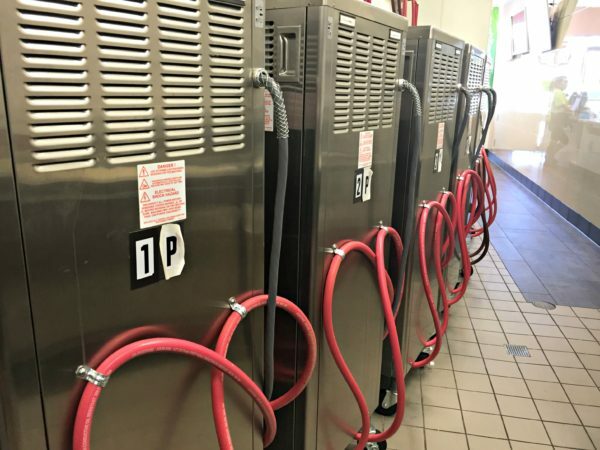 We recently had a chance to go behind the scenes at the Santa Monica Yogurtland at Pico and Lincoln, to learn about the yogurt’s journey from dairy delivery to your cup. Owner Chris Hong generously took the time to give us the “inside scoop” on the process. 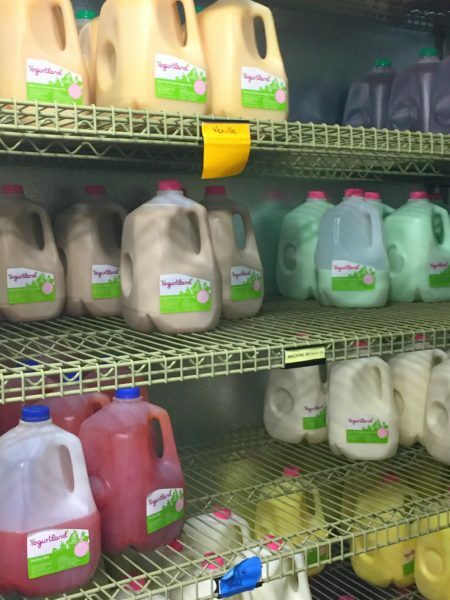 The yogurt gets delivered twice per week in gallon jugs and is stored in Yogurtland’s giant walk-in refrigerator. Each store’s owner has to calculate exactly how much to order of each flavor for their specific location because the yogurt must be used within days (not because the yogurt would go bad, but because of Yogurtland’s strict freshness standards). At any given time, each store will offer at least one tart flavor and one dairy-free flavor. Next it’s off to the specialized mixing machines where the yogurt gets slowly churned and frozen. Below, here is Cookies and Cream beginning its transition from yogurt to frozen yogurt. 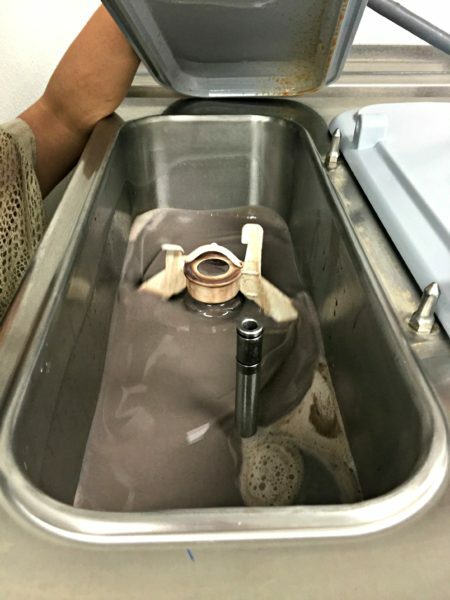 After that, it becomes the frozen yogurt that you know and love – and it’s ready for you to squeeze out from the other size of the wall from where it’s been churning. “There’s nothing else that we will prep other than fruit. All of the yogurt comes pre-made for us,” says Hong. 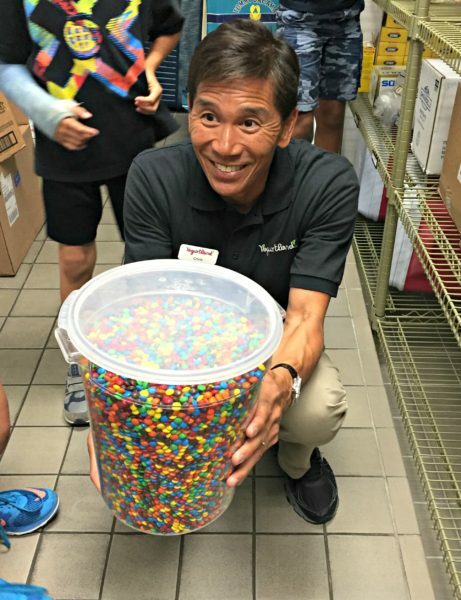 Yogurtland owner Chris Hong jokingly offers to give away the store’s M&M stash. Back in the pantry area is every imaginable yogurt topping, including chocolates, cereals, and sprinkles. (One loyal customer comes to the Santa Monica location every week and buys only a container of sprinkles.) Other toppings, like cheesecake bites, cookie dough, fruit, and brownies, stay in the fridge. The toppings vary by location due to regional tastes, but Hong tells us that strawberries are a consistent top seller. And with that, you’re on your own to make your own unique combination of yogurt and toppings. Pictured below is our kid loading up on toppings, but (true story) personally we love the plain tart yogurt so much we rarely put on anything on top. About Yogurtland: It was started in 2006 by Phillip Chang, and now has more than 330 locations worldwide. If you haven’t been to Yogurtland yet, find one near you and put it on your summer to-do list. And if you happen to be near the Santa Monica Yogurtland at Pico and Lincoln, be sure to pop in and say “hi” to Chris Hong. 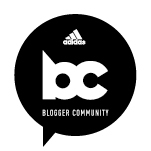 Blogger disclosure: I attended the tour with a school group unrelated to this blog. I did not receive compensation for this post. All opinions expressed are my own.